I recently had the opportunity to visit one of my most favourite spots in South Africa. Giants Castle Nature Reserve is known for its magnificent San rock art, fabulous hiking, invigorating climate and the vulture hide. 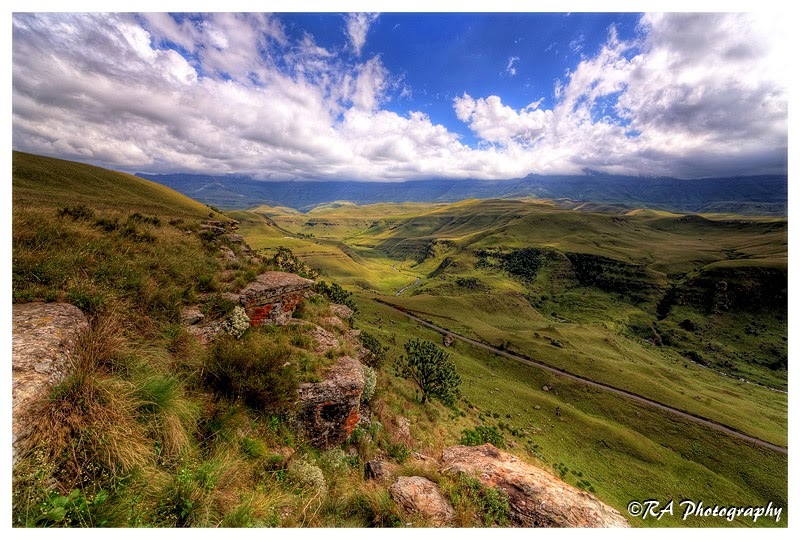 This KwaZulu-Natal nature reserve is an historic place and home to the Bearded Vulture. 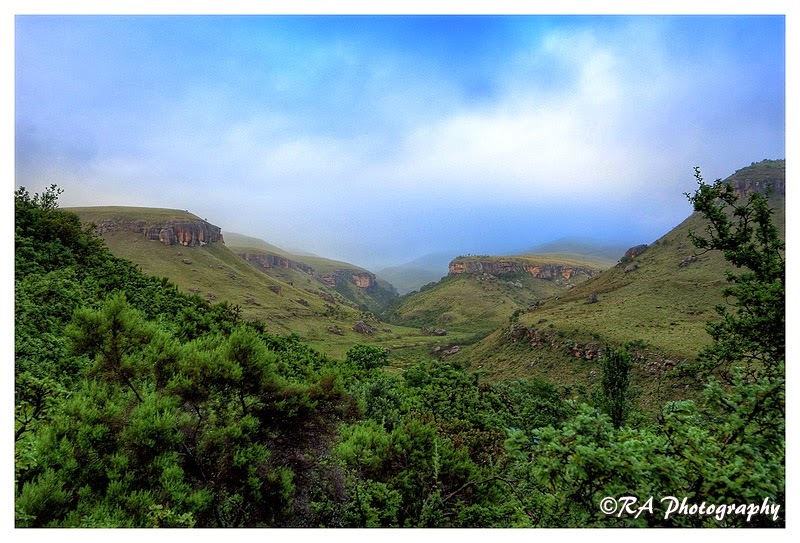 This beautiful reserve was named in honour of the peaks of the Drakensberg Mountains, whose silhouette resembles that of a sleeping giant. 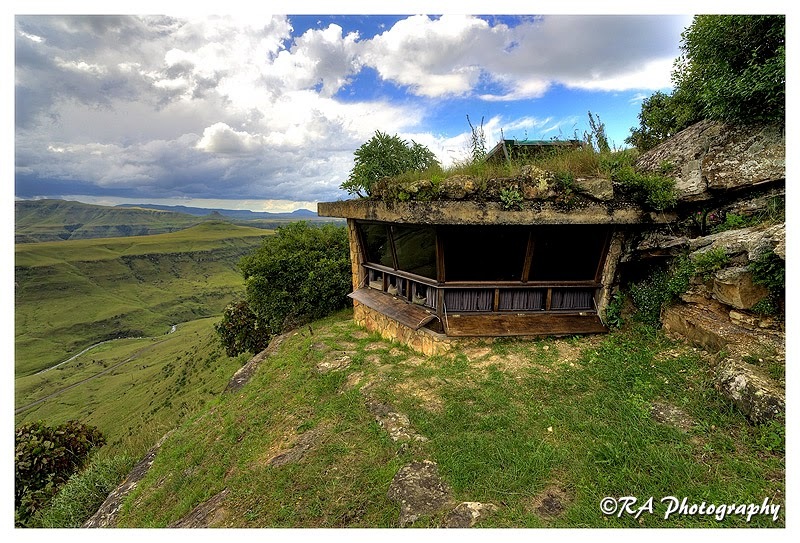 The vulture hide is situated high on the side of one of the peaks and affords people to be able to observe and photograph these majestic birds. 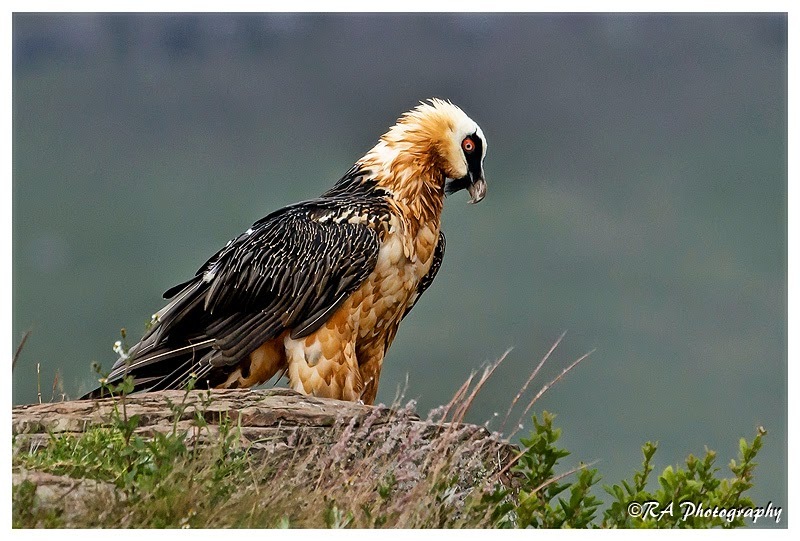 The site is frequented by both the Cape and Bearded vultures as well as on occasion, other birds of prey. I arrived in somewhat cloudy and wet weather and was hoping for the best. The road up to the hide was at times very slippery and the 4x4 really worked! We quickly set up in the hide and then scattered the bones we had brought in the area in front of the hide. The waiting game began! Within minutes the crows and starlings were there and these can become rather annoying pests. 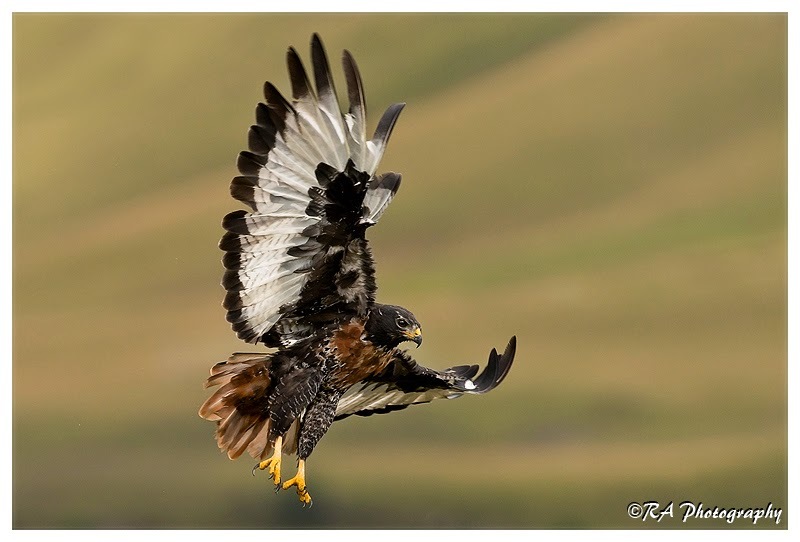 They pick up and fly away with the bones, as if they were out shopping for their evening meal. We hadn't been there for long when I noticed some ears rising over the horizon. 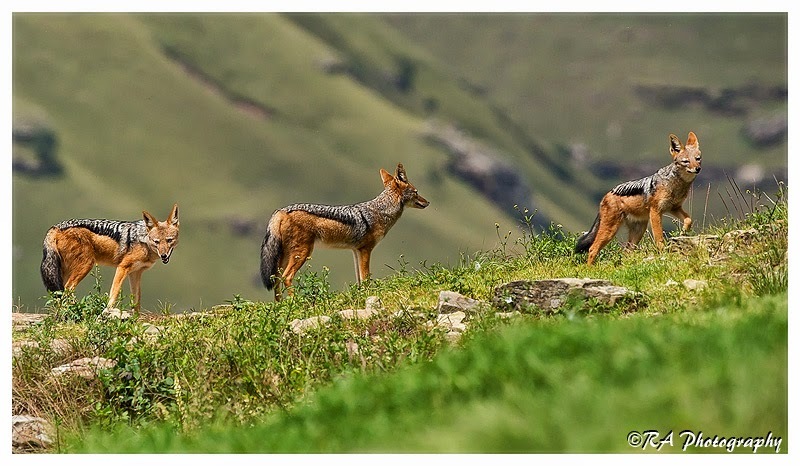 The Black Backed Jackals had come for their meal. Although they are at times also active during the day, they mostly rest up in holes dug by other species such as ant bears (aardvark), as well as other shelters like rock crevices, under bushes etc. 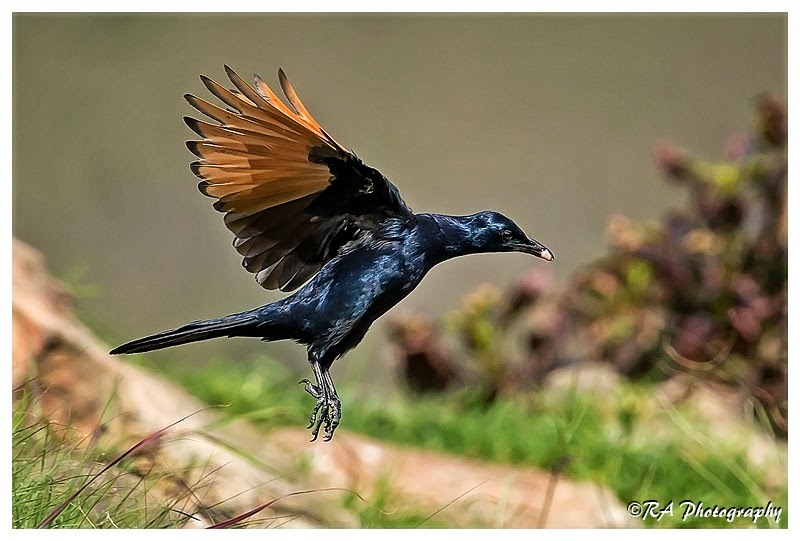 They are very active at night and are often seen at dusk and dawn. In areas where they are protected they are also active on cool overcast days, but in areas where they are persecuted by man they tend to be shy and hide away. Well this was an overcast day and there was easy food to be had so they were coming in for their lunch. A bit of rivalary for the lunch but no serious damage done. We had been watching the skies for any signs of the vultures that I had actually come to photograph and eventually we spotted a couple of birds doing the circling pattern for which they are so well known. A couple of Cape Vultures had arrived and were doing fly byes to see if there was something for them to snack on. The Cape vulture is one of the nine different vultures recorded in Southern Africa. Its conservation status is classified as “Vulnerable”. What makes this species so important is that it is endemic to this region and is found nowhere else in the world. 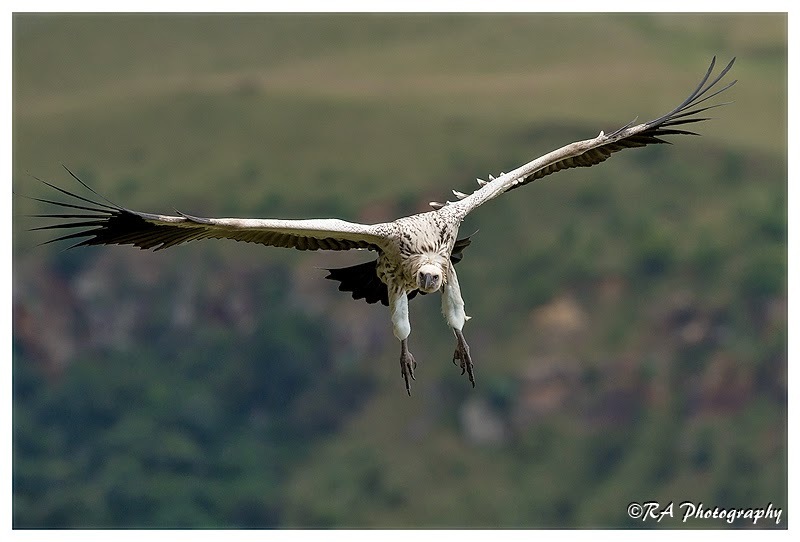 If our Cape vultures become extinct, there are no replacements! 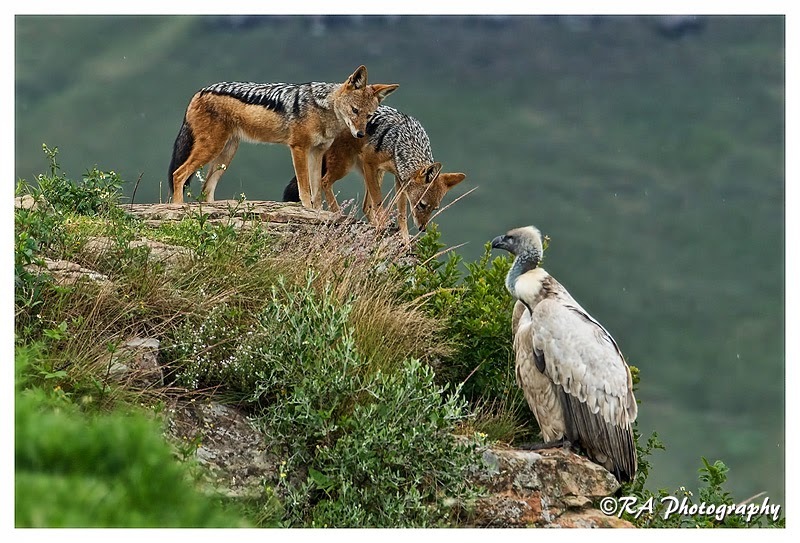 Cape vultures used to occur all over southern Africa, even on Table Mountain, but now their population is declining and there are only six big breeding colonies left. 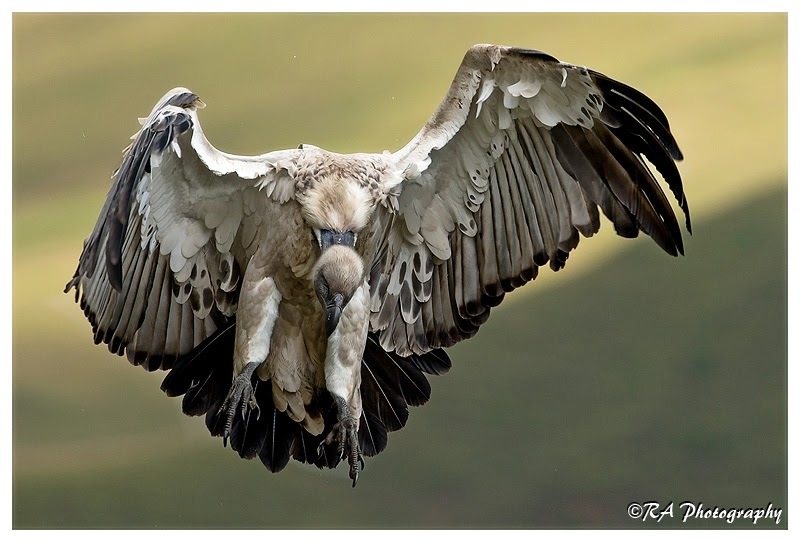 Cape vultures are big, bulky, creamy-white birds with long, muscular un-feathered necks. Some people call them ugly! Their bald heads and long necks help them to keep clean while scavenging and accessing juicy morsels from right inside the carcass. Males and females look alike. 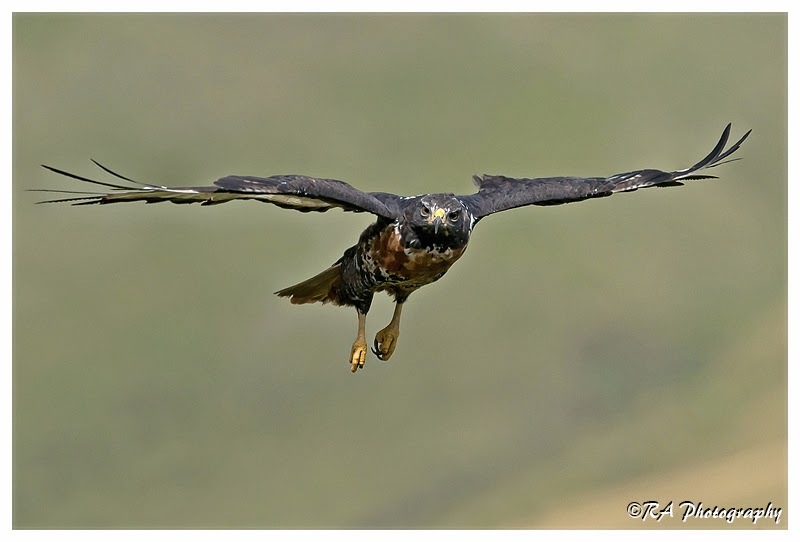 Young birds have brown eyes which change to the yellow colour of adulthood at about five to six years of age when they become ready to breed. Gliding past looking for food. Flaps open, brakes on, landing gear down! 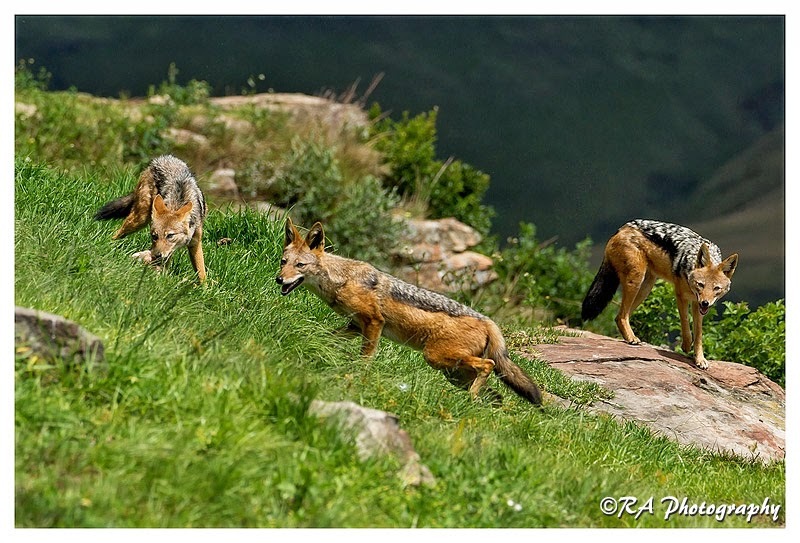 The scavengers check their competition out. The crows were coming and going and then one of them seemed rather odd to me. I took the binocs out and there, coming in was a Jackal Buzzard. 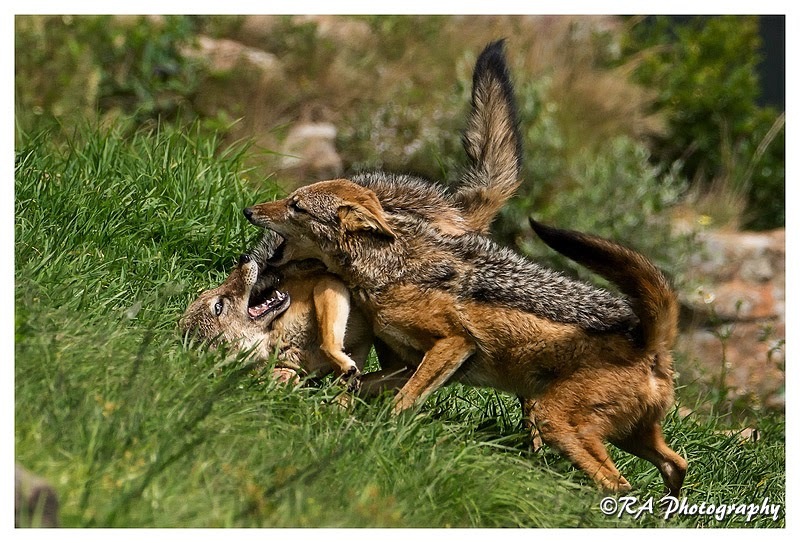 The adult South African Jackal Buzzard is strikingly plumaged. It is almost black above with a rufous tail. 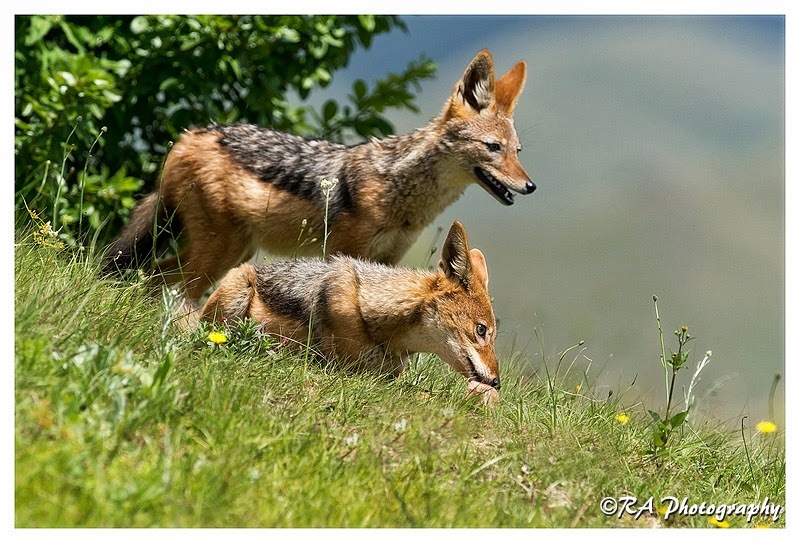 They have a weeah ka-ka-ka call like that of Black-backed Jackal, hence its name. I was still waiting for what I had really come to see and photograph. I had caught a glimpse of a juvenile Bearded Vulture fly past earlier and I was really hoping for an adult to arrive. 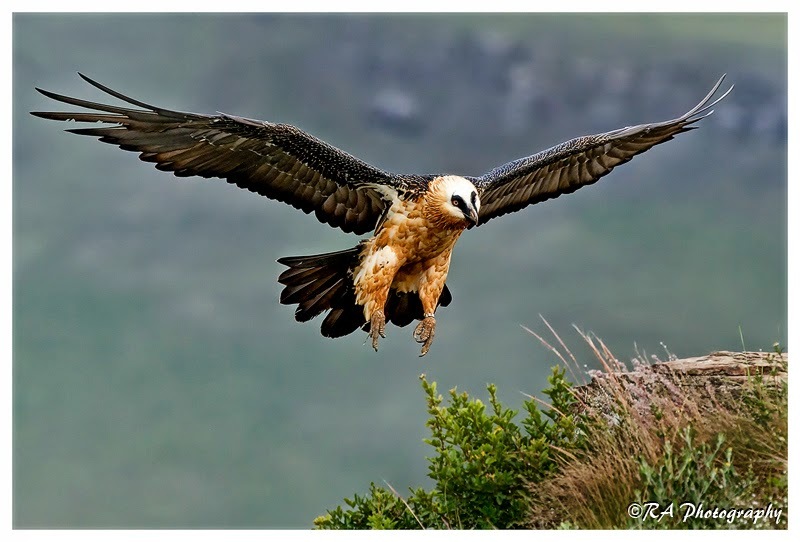 The Bearded Vulture (Gypaetus barbatus), also known as the Lammergeier or Lammergeyer, is a bird of prey, and the only member of the genus Gypaetus. 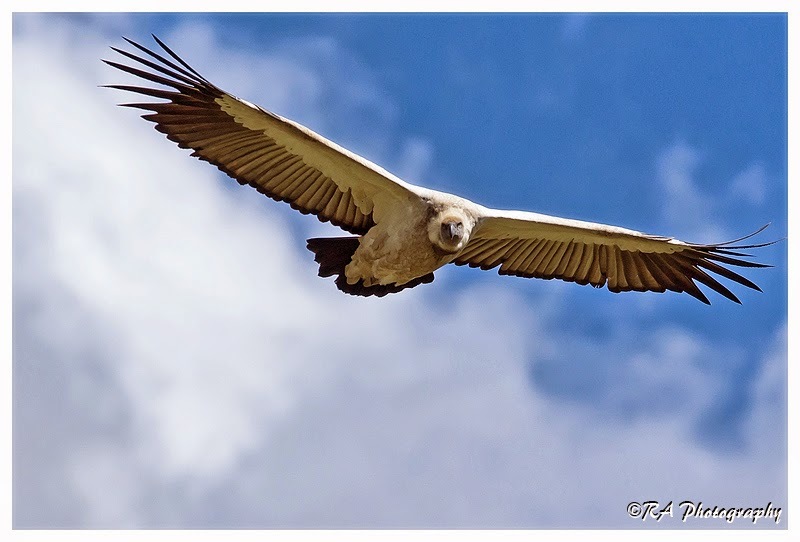 Traditionally considered an Old World vulture, it actually forms a minor lineage of Accipitridae together with the Egyptian Vulture (Neophron percnopterus), its closest living relative. It is not much more closely related to the Old World vultures proper than to, for example, hawks, and differs from the former by its feathered neck. 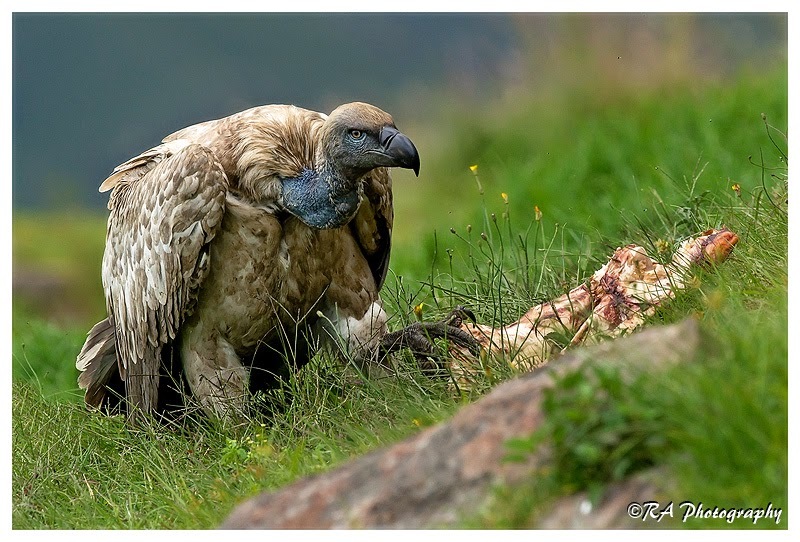 Whilst it is a vulture and feeds off carcasses it usually disdains the actual meat and lives on a diet that is typically 85–90% bone marrow. This is the only living bird species that specializes in feeding on marrow. The Lammergeier can swallow whole or bite through brittle bones up to the size of a lamb's femur and its powerful digestive system quickly dissolves even large pieces. 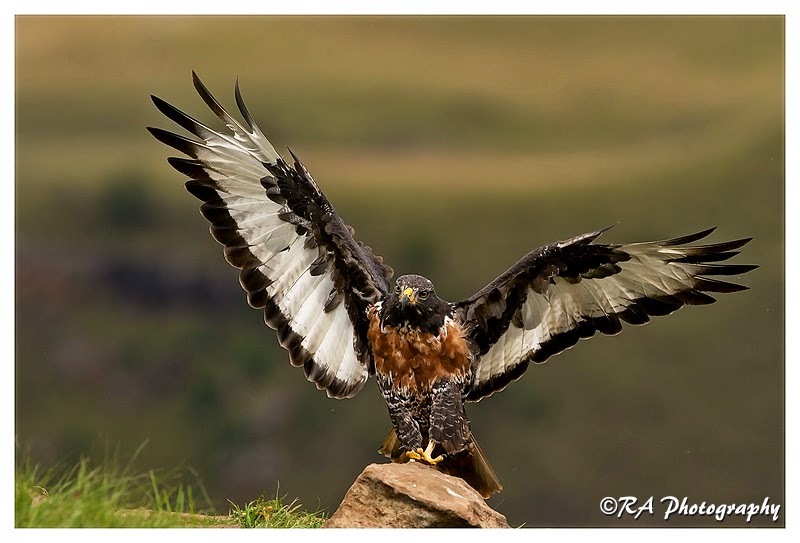 The Lammergeier has learned to crack bones too large to be swallowed by carrying them in flight to a height of 50–150 m ) above the ground and then dropping them onto rocks below, which smashes them into smaller pieces and exposes the nutritious marrow. They can fly with bones up to 10 cm in diameter and weighing over 4 kg or nearly equal to their own weight. 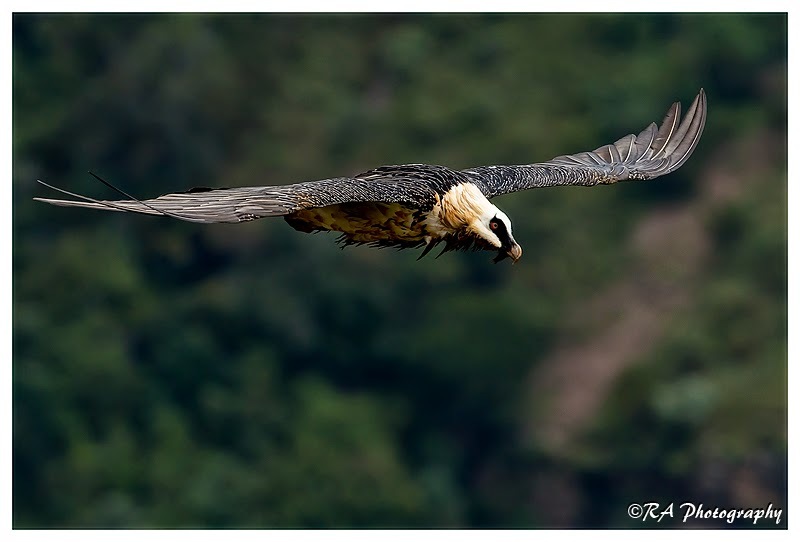 A juvenile Bearded Vulture doing a fly by. I stayed in one of the chalets in the Giants Castle reserve and while sitting on the patio having some much needed refreshments, this sight was in front of me. A truly wonderful experience. It is no wonder that the hide is booked up for about a year in advance.